Purchase any Hitachi product, attach a photocopy of sales receipt / invoice & a photocopy of Hitachi warranty card and mail it to us. Link the respective Hitachi products to get the desirable outcome. Fill in your particular and mail this contest form to HITACHI SHIOK RAYA Contest Program Centre, 332-334, Wisma AQM, Jalan Midah besar, Taman Midah, Cheras, 56000 Kuala Lumpur. 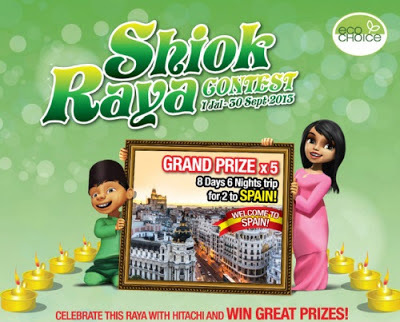 Visit Hitachi contest page for more details.